We are prime Manufacturer, Exporter & Supplier of high quality Motorized Instrument Table. This Table is made with superior quality raw material using ultra modern techniques. 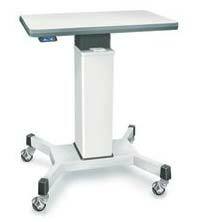 We make Tables spacious enough for doctor as well as patient. Our Tables have strong and sturdy base for mounting heavy equipment. They have smooth finish and are noise less. We can make available this Motorized Instrument Table in all parts of the world majorly in U.A.E, Philippines, Hong Kong, Lebanon, Amman, Portugal, Vietnam, U.S.A., Indonesia and France. The motorized instrument Table from Plantech is specially engineered for more legroom for both the doctor and the patient, enabling better interactions. The strong, sturdy base enables mounting of a range of large-sized testing equipment (Perimeter and other Ophthalmic Instruments). Its optimal balance ensures uninterrupted efficiency. The smooth & noiseless, motor-driven, convenient, feather touch vertical height adjustment is a testimony of the evolved engineering that goes in to this table. The high-quality castors ensure smooth movements and unshakeable stability.